Plug-in hybrids will cease to be eligible for the UK’s Plug-in Car Grant on 9 November, under a reformed system focused on increasing uptake of electric and hydrogen fuel cell vehicles. 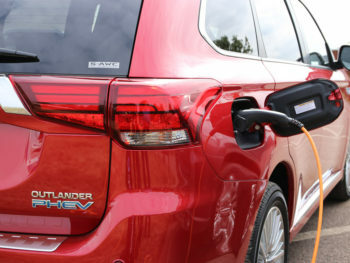 The Outlander PHEV is popular with UK fleets. The Plug-in Car Grant has funded more than 160,000 ultra-low emission vehicles since it was introduced in 2011, initially offering £5,000 or put to 20% off the purchase price of a new car, though the system was revised in 2016 to introduce three categories and reduce the incentives to £4,500 for electric and hydrogen cars, or £2,500 for plug-in hybrids. However, demand has been weighted towards plug-in hybrid and range-extended electric cars, which (according to SMMT figures) have accounted for between 50% and 83% of monthly ULEV registrations since the Mitsubishi Outlander PHEV launched in 2014. More than two thirds of the 167,967 grant-eligible cars registered since 2011 have been plug-in hybrids. The new system is said to be “focussing its attention to zero-emission models”, but it reduces incentives across the board. Vehicles under 2016’s Category 1 criteria (sub-50g/km CO2 emissions, and an electric range of at least 70 miles) now qualify for a £3,500 grant, instead of £4,500 before. At the time of writing, this only encompasses fully electric and hydrogen fuel cell vehicles – the BMW i3 REX (which has a small petrol engine as a range-extender), had a long enough electric range to qualify, but it has recently been discontinued. Category 2 (sub-50g/km, electric range of 10-69 miles) and Category 3 (50-75g/km, electric range of at least 20 miles) are no longer eligible for the £2,500 grant, which means no plug-in hybrids qualify. Even forthcoming models, which are starting to exceed 50 miles of electric range, will not receive a grant. That’s despite the announcement claiming these are among the cleanest vehicles on the road, and could offer “significant CO2 savings” compared to petrol or diesel cars. However, the Plug-in Car Grant has never been counted towards vehicles’ P11d values, and HM Treasury’s company car tax bands for plug-in and hydrogen-powered cars are not being introduced until April 2020 – addressing either of those issues would arguably provide a greater incentive for businesses to switch to ULEVs than maintaining the outgoing grant levels. The fleet industry has issued demands that that tax reforms could be brought forward in this year’s Budget, arguing that policy so far does not adequately support the market. Quick implementation of the 4% Benefit-in-Kind band for diesels, announced last Autumn and introduced in April, shows changes can be applied quickly. The new Plug-in Car Grant system comes into force from 9 November, though the rates might be reduced earlier if there is a rush to register vehicles beforehand, the announcement said. This caps the old system at a further 3,000 Category 1 vehicles, and 6,000 Category 2 or 3 vehicles during the transition period. Manufacturers’ internal orders and demonstrators are already no longer be eligible for the old rates, and OLEV said it will limit applications to carmakers who display “anomalous behaviour” in the run-up to the new system being introduced. Cuts to the Plug-in Car Grant have been confirmed a week after the Government said the budget would include a freeze on fuel duty for the ninth year running, and days after Defra hinted that a further eight local authorities might have to introduce clean air zones because they will still exceed the EU’s 2010 nitrogen dioxide limits beyond 2021.